The stage of The Box theatre had been transformed since I last saw it. The night I went to see Matchstick Theatre’s production of Oleanna, the stage had changed into a small office. The office had the typical look of academic interior design: a large desk, wooden chairs, and a mug full of pencils. The set gives an impression of the mediocre. Suspiciously mediocre. I knew that Oleanna couldn’t be about a simple office chat. The banality of the scenario, the set, and even the professor’s tweed jacket with leather elbow patches, began to feel like an obvious trap. Oleanna was introduced in 1992 by the well-known playwright David Mamet. Oleanna is a story about Carol, a young and confused student, who meets with her professor John to discuss her failing marks. John decides put aside his other responsibilities to help Carol improve her grade. The meeting ends and they part ways. When they meet again, the circumstances have shifted in an unexpected way. The tension rose almost immediately. It’s subtle, but persistent. The professor John, played by Cam Johnston, answers a phone call that instantly put me on edge. The conversation was a series of hesitations and interruptions, turning what could have been a thirty second phone call into a painstaking journey. After a minute of watching Cam Johnston stutter into the receiver, I wanted to rush on stage to take the phone from him and hang up. That was only the first ten minutes of the first act! John took more stuttering phone calls. 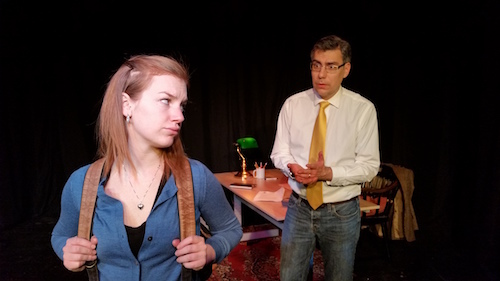 John and Carol, played by Lindsey Middleton, consistently interrupted each other. The two characters repeated themselves, over and over. These stumbling conversations needled me the longer they stayed on stage. As annoyed as I was, I can see now that this aspect of the show was brilliant. I was being prodded by the play enough that I considered being the one who interrupted everyone. Director Jacob Planinc and Stage Manager Gregory McLaughlin made sure to build the tension with every act. The interruptions became more aggressive. The feigned and assumed politeness disintegrated. Even the set felt less cozy and simple. The office seemed smaller with each act, becoming almost claustrophobic. Cam Johnston played John as the pompous professor so well. He hid his smugness under the guise of friendliness and humility. Johnston played him as a man who was convinced he was the smartest person in the room. Lindsey Middleton played Carol as a whimpering young woman, at first. She played Carol as confused and frustrated, which made me feel for her. However, I wasn’t fully aware of her talent until the second act. She came back with attitude and filled the stage with her presence. She was harsh and quick and funny. She was anything but meek and I ate it up. Without giving too much away, I will say that Oleanna is a play designed to start discussions, and most likely, designed to start arguments. I talked with my guest after the play about what the ultimate message could be. Even now I’m not sure if there is one ultimate lesson that I should take away from this. What I know is that this play is designed to spark something inside of you. The show is clever, tense, and well-acted. I think you should go see the show and let it rile you up. Oleanna is playing at The Box (89 Niagara Street, #103) until Sunday February 21st, 2016. Remaining show times are February 20th at 2:00pm and 8:00pm, and February 21st at 2:00pm. Tickets are $15 in advance and $20 at the door. Tickets purchased in advance can be found online.